When to Replace Ceramic Briquettes? Ceramic briquettes help to improve the gas grilling experience, giving food that special grilled flavor without the use of charcoal. While these small blocks of ceramic are designed to last for years, they eventually require replacement, according to Grilling.com. Periodically replacing ceramic briquettes helps to ensure successful summer barbecues by giving guests that perfect grilled food flavor they crave. If you look inside your gas grill and see a layer of stones or blocks, your grill is likely equipped with lava rocks or ceramic briquettes. Lava rocks are generally covered with tiny holes, while ceramic briquettes are smooth and nonporous, with a pyramid, diamond or charcoal shape. As you grill, the briquettes absorb grease and food drippings, which serves two basic functions. First, it prevents the grease from falling into the burners, reducing the risk of dangerous flareups. Second, contact with the hot briquettes vaporizes the grease and drippings, sending it into the food above to add flavor. Over time, ceramic briquettes develop a sooty, greasy finish that can impact their performance. Before you consider replacing briquettes, try cleaning them to save money and restore their original condition. Lowes reports that ceramic briquettes work like a self-cleaning oven, burning off grease and grime naturally. To clean your briquettes, start with a cool grill, then remove the grate. Turn the briquettes over so the greasy side faces down, then turn the grill on. Place the cover down, and allow the grill to run for 15 minutes. Turn the grill off, and allow it to cool down, then inspect your ceramic briquettes. If they are clean, they are ready to use for grilling. If they haven't come clean, it's time to consider replacement. Excessive grease buildup that won't come off with routine cleaning is a sign that briquettes should be replaced. Other signs include crumbling, cracked or otherwise damaged briquettes or unpleasant odors while you grill. CNN suggests letting your taste buds tell you when it's time for replacement, citing a rancid flavor as a sign that briquettes have reached the end of their useful life. Failure to replace ceramic briquettes when you spot one of these signs could lead to frequent flareups, uneven heating and cooking and poor flavor results while grilling. Gas grill owners use lava rocks, ceramic or metal tiles and special flavor bars to replace standard ceramic briquettes. Lava rocks serve as an economical option but tend to produce more flareups due to their porous nature. Metal radiator plates and ceramic tiles offer consistent, even heating, while some grill makers produce special ceramic or metal flavor bars that can take the place of rocks and briquettes. 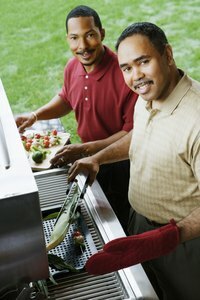 Check with your grill's manufacturer to explore your various replacement options.